The following photos are just but a few of those taken on the three dates. Looking south along Epala Street from cnr of Kate Street. Photo taken using Motorola E398 mobile phone camera. 7 October 04 Cnr Kate and Epala St. Note no sediment protection of storm water drain. Remaining photos taken using Fuji A205s digital camera at 2 megapixel then resized and compressed. Photo taken 11 October 2004 Note the two hay bales in front of stormwater pipes. 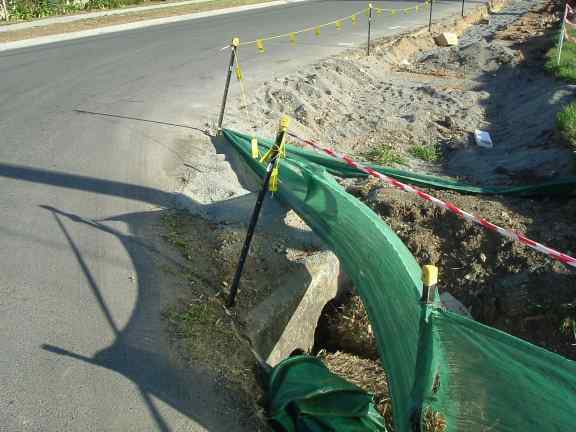 Sediment fence blowing in breeze else lying on ground. Note that the barricades are now in place and that the sediment fence does not even tough the ground. Note no retention of builders waste occurring on site. Paper, plastic, cardboard blowing around site. Note in photo below the plastic waste near green fence. Note sediment fence serves little purpose at it does not even touch the ground. Note the lack of sediment fence. Storm water drain appear blocked. 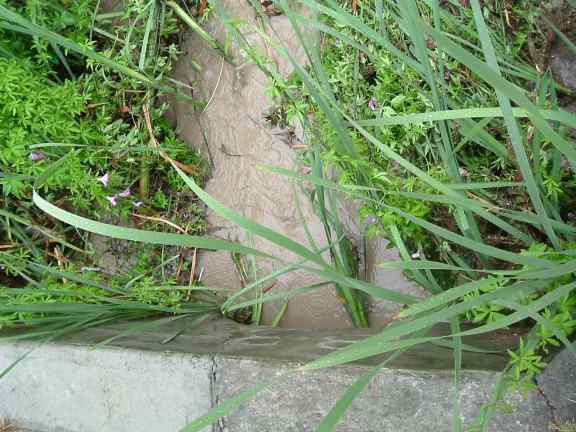 Water has flowed across road taking sediment across as shown in next picture. Sediment in gutter across road. 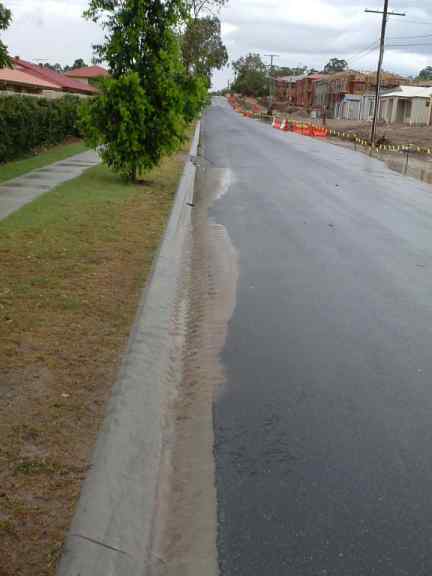 Sediment laded run off on epala street frontage. Note no sediment fence. More sediment laden water running of development site. Note no sediment fence. 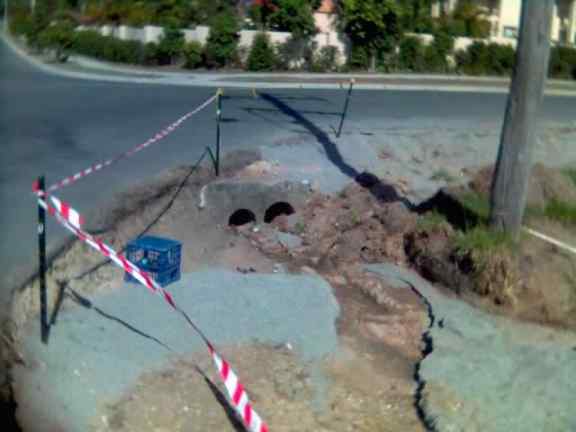 Stormwater drain further east along Kate Street discoloured discharge. If you have any Concerns about the above development site then please read on. 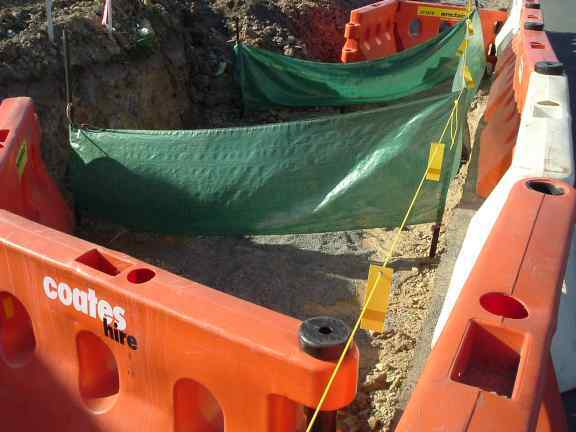 At about 9.00 pm on 18 October 2004 I visited this site to discover that no work has taken place to repair, install or maintain what little sediment control at this development. This is even though BCC Standards state this must happen. 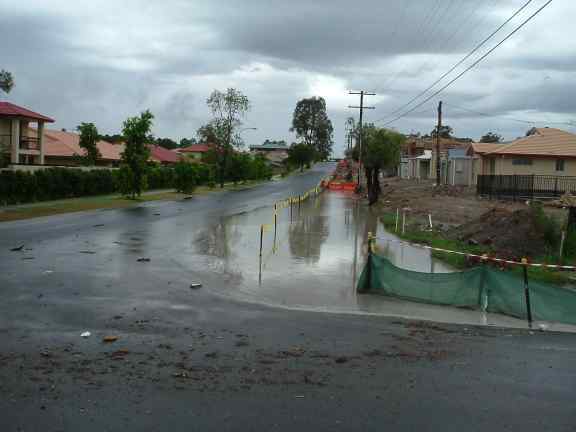 (5.1.20) Brisbane registered about 42 mm of rain during previous 24 hours. The first visit to site by BCC officer re my first complaint (R583445) was Saturday 9 October 2004 that is 2 days later. Since that time several BCC employee have visited and taken photos yet this site is still an environmental nightmare. I have also spoken to at least three BCC officers who have phoned me or I have made contact with them. I also made contact with the on site project manager the next day (8 Oct) after I took the first photos and suggested that several items needed his attention. 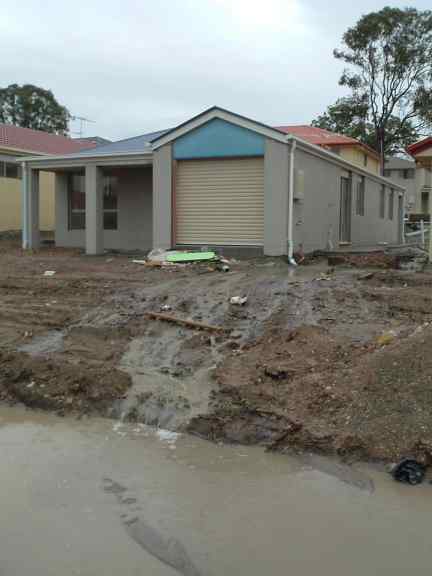 The building site is only a few hundred metres from Bulimba Creek. 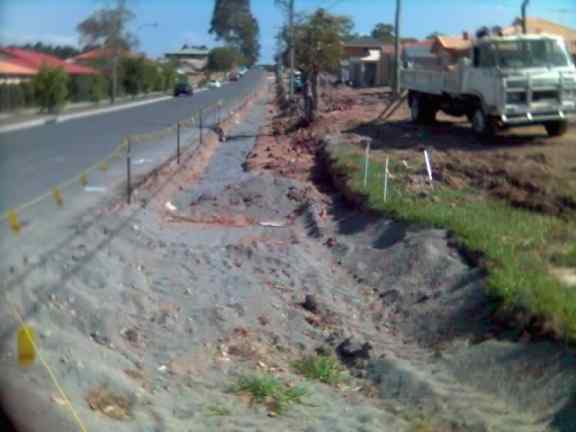 So much for the Brisbane City Council's Erosion and Sediment Control Standard. Section 5.1.20 is not complied with nor enforced. So much for the on the spot infringement fines that can be issued for non-compliance. 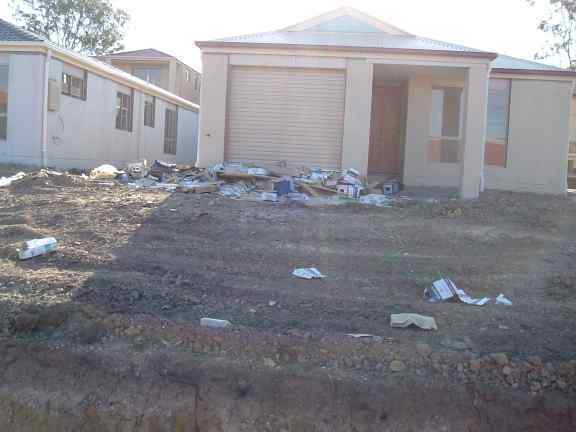 So much for this developer who is in non-compliance with several different Queensland laws. There is no builder's sign on the site nor the builders registration number displayed. Builders Services Authority breach. 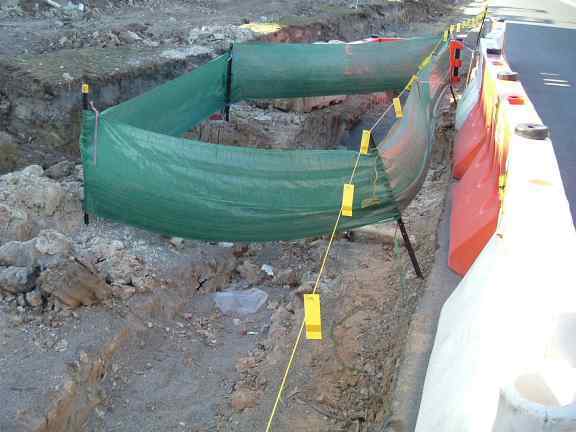 There were no safety barricades around the gully pits when I first inspected. No WPH&S signs Workplace Health and Safety Act. 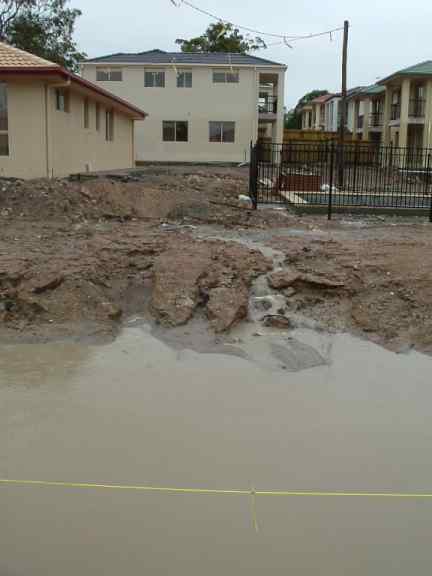 There were and still are not any sediment and erosion fence around the building site. Environment Protection Act, EPP Water. These breaches are all visible from the footpath. Just how many more there are is anybody guess. Maybe some trained inspectors would find twice or three times as many once on site. It is now the time for the Queensland Government (The SMART STATE) to take action to massively increase the penalties for errant developers as the one responsible for the above Development. Apparently $300.00 fines are no worse that a pin prick to the budget. Our Group now calls upon each reader of this e-mail to respond as to the action that they are willing to take to address this development site and to increase penalties to better encourage developers to protect our waterways. Please feel free to distribute this e-mail to other concerned colleagues. Feel free to send your e-mails of concerns to those who have the ability to make a difference. However I would expect responses and undertakings from the Premier, Minister for Environment, Minister for Local Government, Minister for Primary Industries, Minister for Natural Resources, and the Lord Mayor. Then a few day letter this Press Release from the Minister for the Environment. The Queensland Government has identified Moreton Bay and the waters of South East Queensland from the Gold Coast to the Sunshine Coast as an area of special significance in its drive to improve the health of Queensland waterways. Environment Minister Desley Boyle said the waters of South East Queensland were a defining characteristic for the region with outstanding heritage, economic and social values. Ms Boyle said Moreton Bay was a wetland of international significance. "Where else in the world can you have a city of 2.7million people and 45 minutes away, dugongs, turtles and a reef? But that close proximity requires careful and sensible management. "Many years of urban and agricultural development has seen mud and chemicals flowing into our waterways, reducing their health," Ms Boyle said. "Moreton Bay and other waterways in South East Queensland are no exception. Letting these waters continue to deteriorate would have major economic and social implications for the region's economy." Ms Boyle said the State Government was embarking on a major initiative aimed at finding the best ways to protect Queensland's priceless water environments - and every Queenslander had the chance to be involved. Today the Minister released an information package to provide the basis for extensive consultation on water quality guidelines as well as a particular focus on the environmental values and water quality objectives of three of Queensland's unique water environments. Ms Boyle said Queenslanders could make written submissions or attend a series of community meetings across the State during November which give people the chance to have their say on protecting waterways. The meetings will look specifically at waterways in three regions - Douglas Shire in Far North Queensland; the Great Sandy Strait and the Mary River Basin in Wide Bay; and waterways from the Gold Coast to the Sunshine Coast, including Moreton Bay. "We also want feedback from the community on the draft Queensland Water Quality Guidelines 2004 which look at broader, State-wide water quality targets," Ms Boyle said. "The water quality guidelines will help set Queensland-wide water quality targets that are necessary to protect the various uses of our waterways, such as recreation, sustaining aquatic life or agriculture or supplying drinking water. "Queensland's waterways - our rivers, estuaries and coastal waters- are among the State's most valuable assets." "We want people to tell us how they use their waterways, what affects water quality and how we can best reduce or limit the degradation of Queensland's precious water resources. "The involvement of all sectors of the community is essential to reach outcomes that balance the social, economic and environmental concerns of Queenslanders," Ms Boyle said. "Our marine life requires healthy water. Seventy-five per cent of our seafood lives part of its life in a creek or estuary or in waters that receive fresh water flow. That's our prawns, our crabs, barramundi and salmon. Ms Boyle said a number of consultation meetings would be held in South-East Queensland. These meetings would focus on the Noosa, Maroochy, Caboolture, Pine, Brisbane, Bremer, Logan Albert, Broadwater and Gold Coast waterways, Pumicestone Passage and Moreton Bay. The community's views will be combined with EPA data to develop specific regional targets to protect water quality. "I urge everyone who loves South East Queensland wonderful waterways to participate in this important project," Ms Boyle said. Information reports and draft guidelines are available from the EPA's web site at www.epa.qld.gov.au or phone 1800 177 291.
click on the link that allows you to check your subscription details. The address with which you are subscribed is 'rivermouth@rag.org.au'. especially in relation to upper and lower case characters.